The Gibson Flying V Medallion was made in 1971 only - with less than 350 made in total (although the serial number sequence accounts for 353 - some of these would undoubtedly have ended up in the Gibson rejects bin). The design of the Flying V Medallion was very similar to the first reissue Flying V, but each had a unique limited edition medallion gold colored coin engraved with its production number screwed to the top of the body. The case also had a medallion coin attached to it - but without the engraved number. 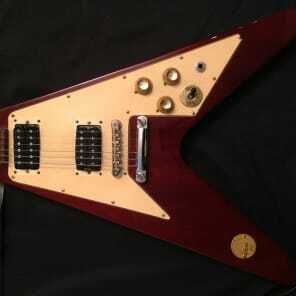 The Flying V Medallion had 3-piece mahogany neck and 2-piece mahogany body with rosewood fingerboard. 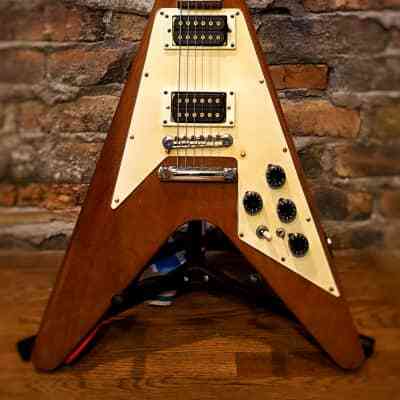 The peghead was slightly different being shorter than the first Flying V reissue model. Pickups were two PAF humbuckers. Source: Flying V Medallion website - registry of medallions. 2017 $16000 good #187; original w/ original case; Sounds and plays wonderfully. Take the GIBSON Flying V Medallion price survey. Buy GIBSON Flying V Medallion electric guitars.